Poodles come in three poodle sizes and shapes. There's the toy, miniature and standard. Kings and royals are just large sized standards. Poodles are athetically built with long legs, broad chests, muscular necks and nicely shaped heads. They are instantly recognizable due to their build and curly locks. Deciding on poodle sizes and the size of dog you want depends on your lifestyle habits, the number of young children you have, and how big your house or apartment is. Toys are the smallest of the poodle sizes. You can pick them up and take them with you! At the shoulder high point they are 10" and under. We've seen them in tote bags carried by their owners! Toys have big personalities, and think they are standards! They weigh about 6 to 12 pounds. Holly acted much bigger than she was, although I don't think she realized she wasn't a big dog! Toys are very spirited, not high strung, just happy and love to play, be active and make you happy! Toys should not be spoiled. Even though they are little, spoiling them can sometimes make them think they are top dog in the family. There's a possibility of turning a cute puppy into an aggressive dog. Train your toy puppy as soon as you bring them home, and you'll have a happy, gentle and loving family member. Should you get a toy if you have small kids in the family? It can work, but you may want to look at a miniature or standard if the kids are very young. The toy may not hold up well to rough play. He may also feel like he is top dog over the young kids and not relate as well to them as he will to the adults in the family as he will see them as pack leaders. If you want to buy toy poodle puppies, toys need to be exercised. Playing with them in the yard or house daily is fine, but it's also good to walk them daily as exercise benefits their health and helps keep them trim. If you live in an apartment or condo, get them outside for a walk daily if possible. Toys are in the Toy group of the American Kennel Club. Toys are more suited for single adults, families with grown children and retired couples. 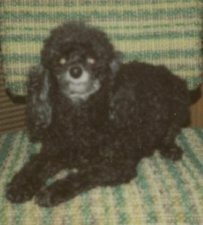 Retirees will find a poodle gives them structure again as they like daily routines. And, it gets you out walking with your dog so both of you get exercise! Teacup poodles are tiny toys and the result of breeding smaller toys. Teacups may suffer more health problems than the toy and may have a shortened lifespan due to inherited illnesses. Miniatures are the next size up from toys. At their shoulder high point they are 11" to 15" and weigh 12 to 17 pounds. They are suitable for families with children, and are probably the most popular size. Like toys, they need daily exercise. Be sure to engage them in fun activities where they can learn as well as exercise. If you see a miniature poodle for sale and want to buy her, they may be suited for apartment living, just make sure there is enough room for them to get exercise indoors as well as outside. Miniatures are members of the American Kennel Club non-sporting breeds class. They often star in obedience training over the other 2 sizes, although all sizes learn quickly and don't forget! A mini poodle needs a bit more exercise than the toy, and they like to play their favorite games with you. They're good for taking on shorter walks. Like most dogs, she'll appreciate doing rather than just sitting. A poodle who isn't getting as much activity as he wants will find ways to amuse himself, maybe something that's not amusing to you! You see an ad for standard poodles for sale and like that they are a bigger dog. 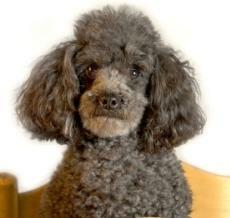 Standards are the largest of the poodle sizes and are 15" or over at highest shoulder point. They can be up to 25" in height. They weigh 40 to 55 pounds (females will be at the lower end). As they are large dogs, they will need to have a larger yard to run around in and will need to be walked on a daily basis. They are not suited as much for apartment living as toys are, but each person will need to make that decision. Keep in mind they need daily exercise and if your apartment gives them room to exercise and walk around PLUS daily walking, a standard may be the right size. These big, active dogs are said to be the most adaptable sized poodle. Standards are also members of the AKC non-sporting breeds group. Standards seem, at times, to be actually smiling in pictures. They're very personable with a pleasing, happy disposition. Some standard pups, between smiles, get serious, studious looks on their faces. They're just taking in their surroundings, studying and learning! Whatever poodle sizes are right for you, you will have a faithful, fun, and extremely intelligent companion that will love you for a long time.